Fill croissants with Gruyère and apricot jam and quickly grill it before serving. Heat a skillet or grill pan over medium-high heat, or preheat a panini grill. Using a serrated knife, slice open the croissant in half lengthwise. Layer the cheese across the bottom half. Spread apricot jam over the cheese. Top with a handful of rocket. Close the croissant. If using a skillet or grill pan on the stove, melt butter and place the croissant on the skillet or grill pan for about 3 minutes on each side, until the croissant is crisp and the cheese is melted. You can press down on the croissant to flatten it. If using a panini grill, set the croissant in the grill and close the lid to cook for about 3 minutes, until the croissant is crisp and the cheese is melted. Serve immediately with cherry tomatoes. 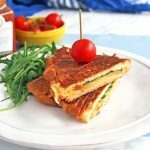 Get this recipe for Croissant Sandwich with Guyere and Apricot Jam at https://www.theworktop.com/breakfast-brunch-recipes/savory/croissant-sandwich-gruyere-apricot-jam/.